Note: I’m sharing this post here, which I originally published on ZAGGblog. Not that long ago, I wrote a post saying that today’s smartphones are killing the point and shootcamera market. Every year, manufacturers find ways to pull even more quality out of the camera you carry with you all day, every day, everywhere you go: your phone. As they take better photos and capture better video, there’s even less reason to lug around a full-size DSLR. I’ve put together this list of 7 things (and an added bonus item) that you’d do well to consider for taking your smartphone photos to the next level, regardless of the particular phone you use. Everything here works with both Android and iOS devices. As an example, here’s a short time lapse video I made last weekend with an iPhone 6 and items 1 and 3 on this list. There’s a reason I put this one first on the list — taking great videos, time lapse sequences, and using the timer function so you can jump in that group photo requires one critical thing: a tripod. 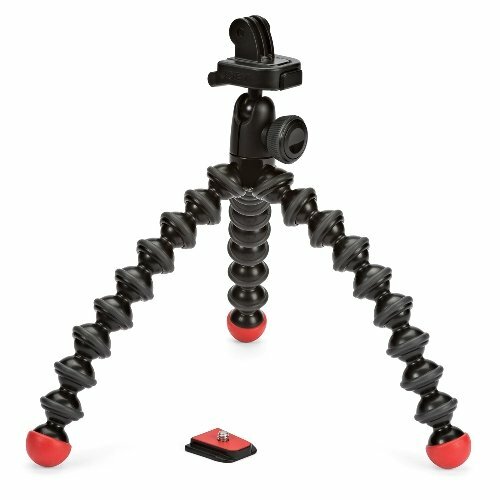 The Joby GorillaPod Action Tripod is the way to go here — it’s lightweight and ultra portable, all three legs flex and bend so you can attach it to things, and it includes two mounts: one for GoPro Hero cameras, and one standard 1/4-20″ threaded tripod mount. To mount your smartphone to the GorillaPod, you’ll need a dedicated mount or bracket, which I’ve covered on item 3 on this list. This is the tripod I used to create the time lapse video above. We found the Joby GorillaPod Action Tripod on Amazon for $39.95. You should also be able to find it at your local Best Buy, and if it costs more, they’ll price match. 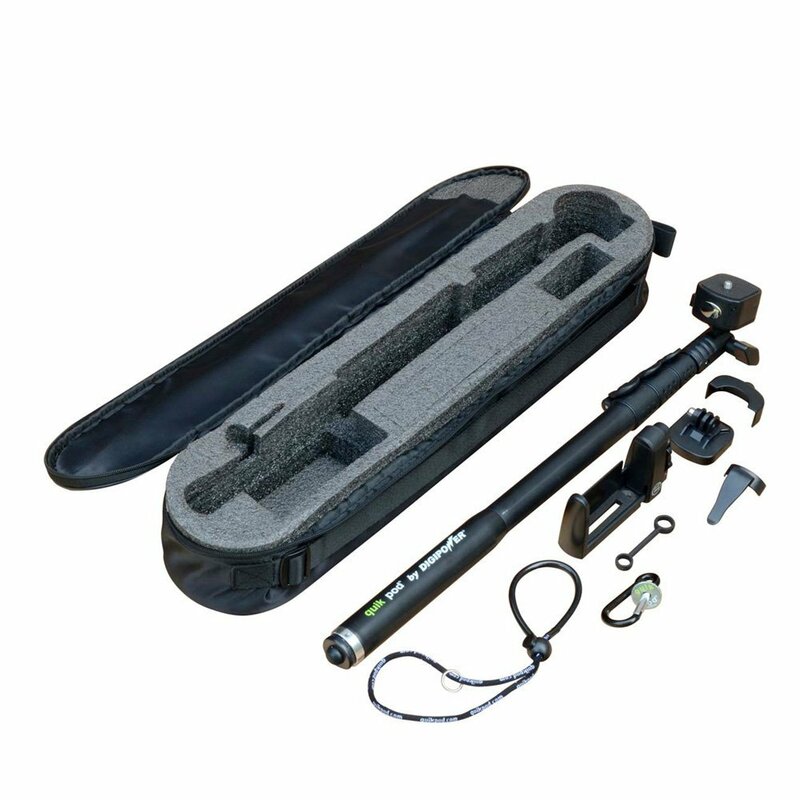 The DigiPower Selfie Stick Extreme is the latest addition to my gear bag. I picked one up recently, as silly as it sounds, and I can’t get over how awesome this thing is. It comes as a kit, which includes mounting adapters for GoPro Hero cameras, smartphones, and regular point and shoot cameras. Basically, you can attach any kind of camera to it. Think of the selfie stick as an inverted monopod. The thick, heavier end is the end you hold, and the lighter, narrower end is what extends out in front of you. The DigiPower Selfie Stick Extreme extends out to 54 inches (4.5 feet), which should allow you to get the entire family in your frame. There are certainly cheaper options out there, but as the old saying goes: you get what you pay for. This one feels solid and stable in your hand, and it comes with all the mounts and adapters you could ever really need. In fact, the smartphone adapter that comes with this kit uses a standard 1/4-20 threaded screw mount, which you can attach to the Joby GorillaPod I mentioned above. That’d let you skip out on the next item on this list, which does the exact same thing. We found the DigiPower Selfie Extreme Stick at Best Buy for $59.99, but Amazon has it on sale for $44 with free shipping as of this writing. If you’re going to buy in-store, get them to price match it. Whether you pick up a portable tripod like the Joby GorillaPod, or you use one you already have, the only missing piece is a mount to connect it with your phone. That’s where the Square Jellyfish comes in handy. 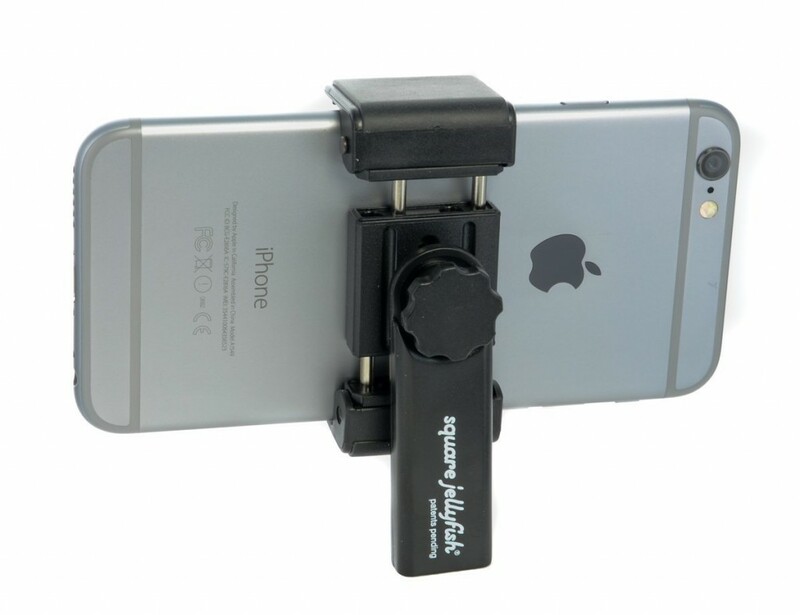 It’s a spring-loaded bracket clamp that securely holds your phone to the tripod. It has two standard 1/4-20″ threaded screw slots so you can choose between portrait or landscape orientation. I picked up one of these a little over a year ago (at full price), and still use it regularly. I’m starting to wear out some the springs, so I’ll probably pick up another one soon. I highly recommend this one. We can’t find the Square Jellyfish in any retail store, so you’ll have to use Amazon. It’s currently on sale ($10 off), which makes it $14.99. 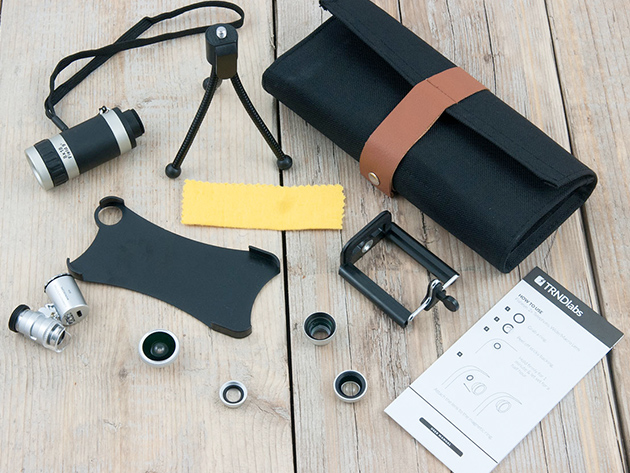 When you’re really ready to get creative with your phone photos, look into a lens kit such as this one. The New Age Smartphone Photo Kit includes SIX different lenses, including a wide angle lens, a fisheye lens, an 8x telephoto lens, a microscope-style lens, and a macro lens, plus a small tabletop tripod and a carrying case for everything. Whether you’re trying to get a good amount of optical zoom (not the digital zoom that your phone does) to keep an image sharp, or whether you want to widen the field of view to fit more people or landscape scene in the photo, this kit has you covered. There’s really no other lens you could think of that isn’t here. The New Age Smartphone Photo Kit is available for iPhone 6 (link), iPhone 6 Plus (link), iPhone 5 and iPhone 5s (link), iPhone 4 and iPhone 4s (link), and the Galaxy S5 (link). It retails for $99, but it’s currently over on StackSocial for $69 through this weekend. Use one of those links above to jump to your particular model. While the New Age Smartphone Photo Kit, above, is as full and complete as it gets, you may not need all that, or want to carry it all around. Olloclip is a great alternative, as it offers the ultimate in portability. As the name implies, it ‘clips’ onto the corner of your phone, over the rear camera and the front. The 4-in-1 lens systems offer a wide angle lens, a fisheye lens, and two levels of macro lenses. Because it’s so small and compact, I take mine just about everywhere (okay, not to the grocery store). The photos it produces are quite spectacular, and it works with any and all camera apps you already use. 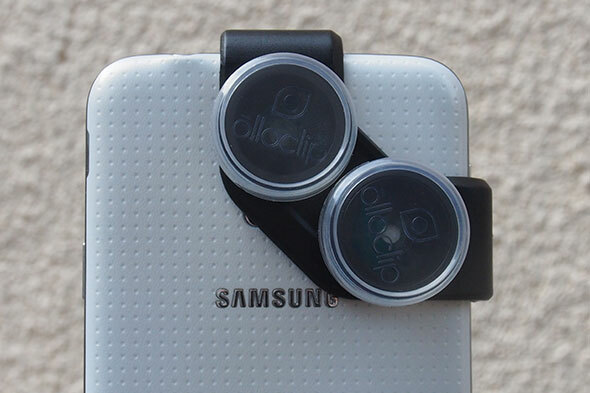 Olloclip is available for Apple iPhone 4 and 4s, iPhone 5, 5S, and 5C, iPhone 6 and iPhone 6 Plus, iPad Air and iPad mini, and the Samsung Galaxy S4 and S5. The Olloclip lineup is available on the company’s website, here: Olloclip Store, and you can also pick them up on Amazon for a few bucks less if you prefer, here: Olloclips on Amazon. Let’s face it: with smartphone camera sensors as small as they are, there never seems to be enough natural or ambient light. Pick up a portable LED light — something pocket size, but powerful enough to light up a room — and throw it in your bag before you run out the door. It’ll help photos come alive, and you can get creative with light positioning to come up with some abstract perspectives. Not only will it work great for still photos, but also video as well. I did some looking and found a few hundred different choices, but the Mudder Portable LED Bar caught my eye. It attaches to the 3.5mm headphone jack on your phone, but has its own internal battery that powers all 32 of its LEDs for up to 2 hours. (For the photo geeks among us, the LED color temperature is 5200K.) 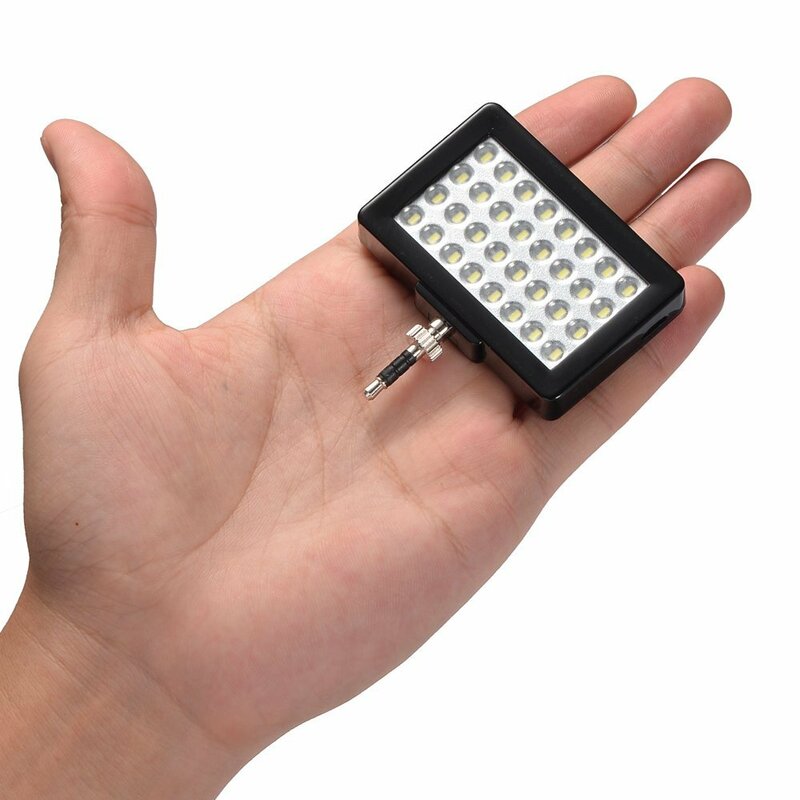 This is a continuous light, not a strobe or single flash unit. The Mudder Portable LED Light is on Amazon right now for $22.99, which is $17 off its retail price of $40. Sometimes I feel like digital photography has really killed the printed photograph. Maybe I’m in the minority here, but I love holding a printed image in my hand, especially those with my friends and family in them. Don’t spend a fortune on a huge printer to lug around — get something inexpensive and portable that you can easily take with you on the road. After reading many reviews, I’ve decided on the Canon SELPHY CP910. It prints borderless photos up to 4×6 in size and one ink tank will print up to 108 full-color photos. 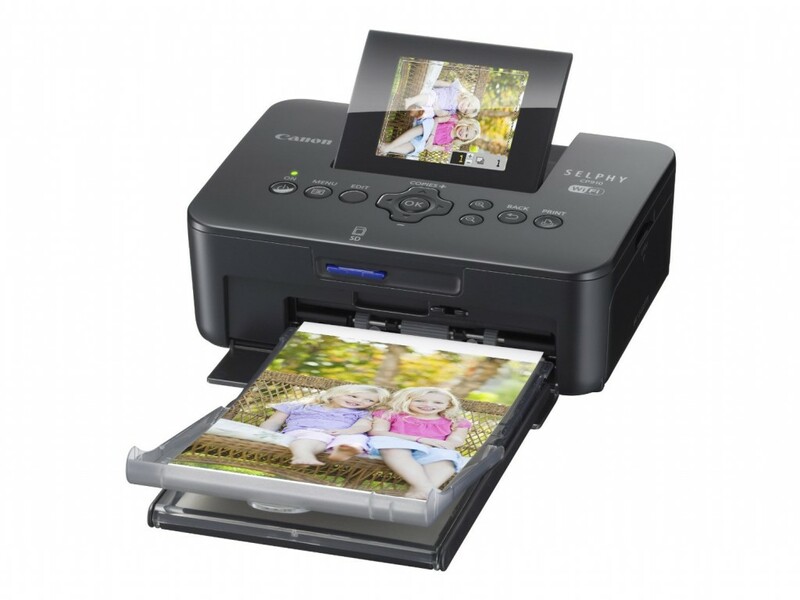 The SELPHY CP910 has WiFi, so you can print to it from any computer, but also wirelessly from iOS and Android smartphones. If you want total mobility, there’s an optional battery pack you can purchase separately so you don’t have to hunt down a power outlet. You should be able to find the Canon SELPHY Portable Photo Printer at any retailer where Canon products are sold (Best Buy has it for $99), but you can also order it from Amazon for $86.99 in both black and white color options. 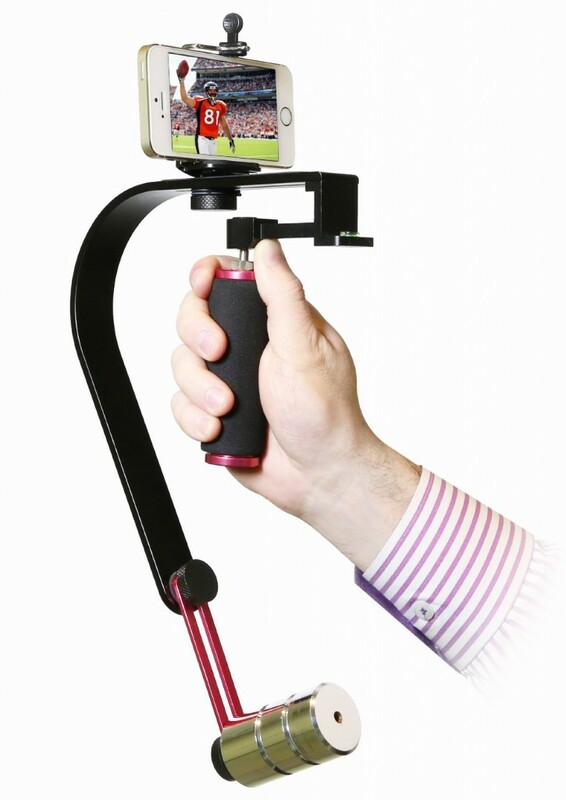 This one caters specifically to those who use their smartphones to record video, as well. While you’d certainly do well with a portable tripod, a smartphone tripod mount, an off-camera LED video light, and even one of the lens kits mentioned here, you’ll also appreciate having a stabilizer for smooth motion videos. This one, the VidPro Stabilizer, works with GoPros and smartphones, and includes the mounts for both. Think of it as a GlideCam for your phone, but less weight and less money. We found the VidPro Stabilizer on Amazon for $49 bucks, and this link will always update with the latest price: VidPro Video Stabilizer for GoPros and Smartphones.